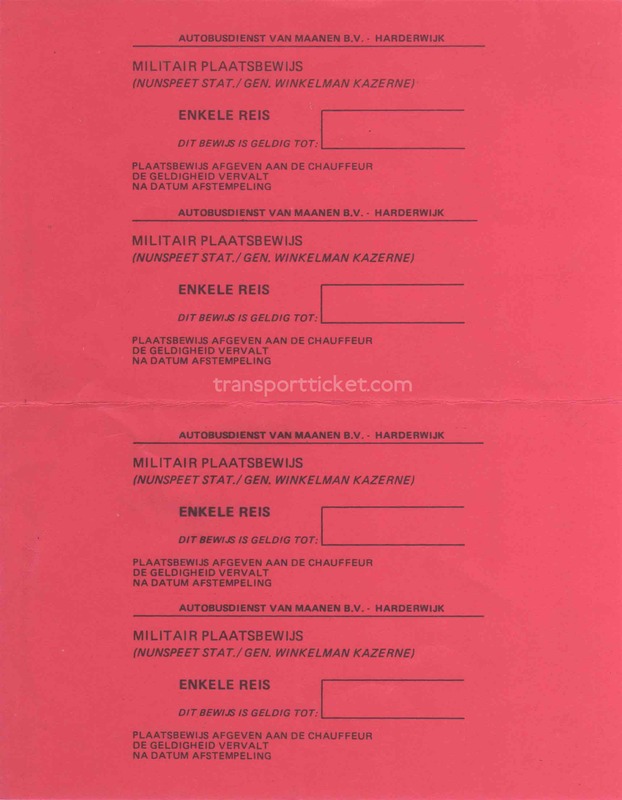 All the following tickets are military related. 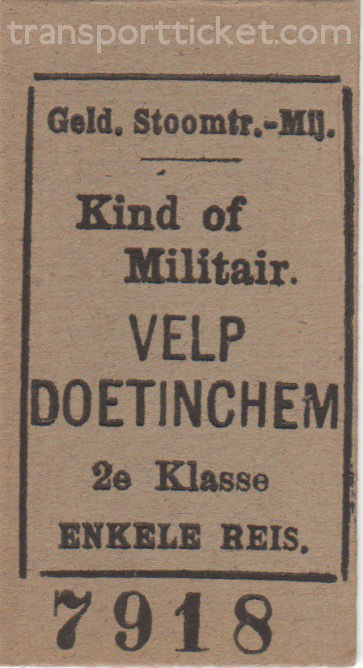 They are meant for military personnel or for a trip to a military base. 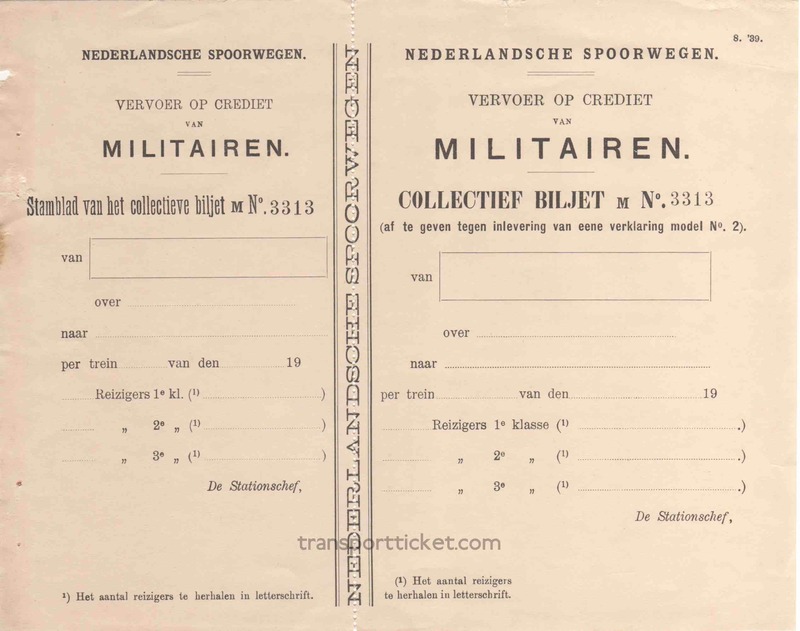 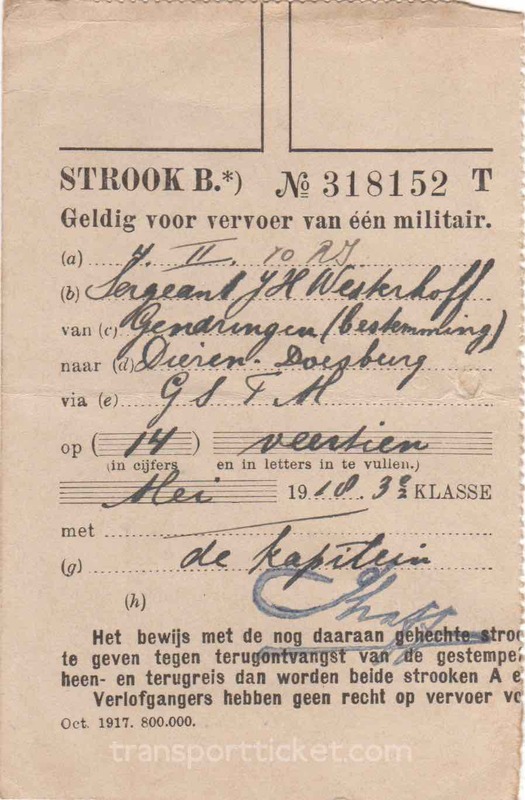 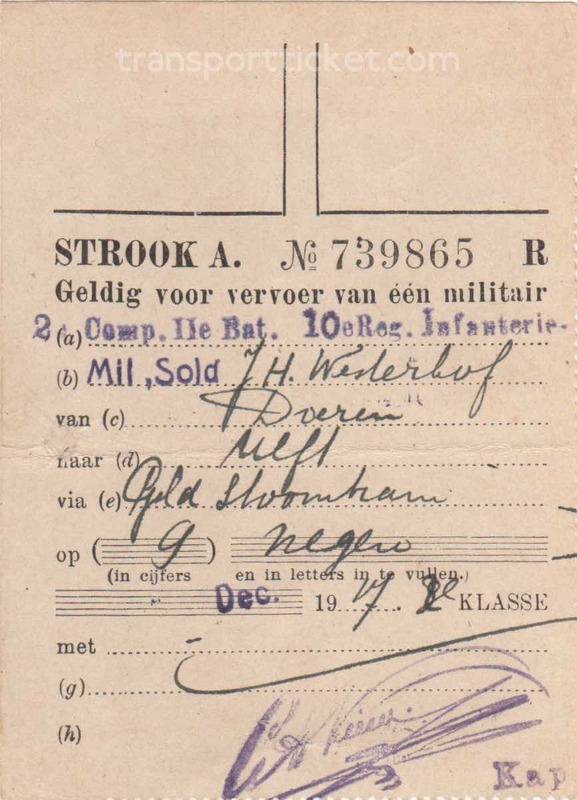 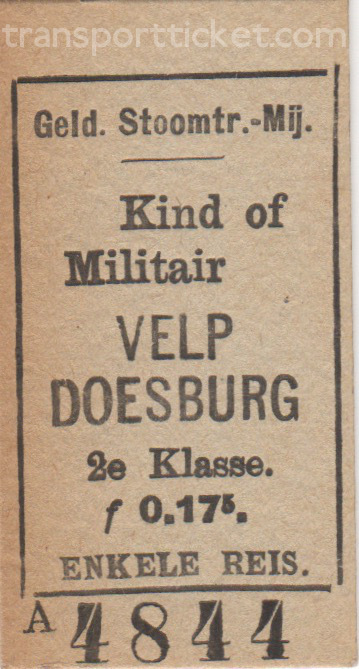 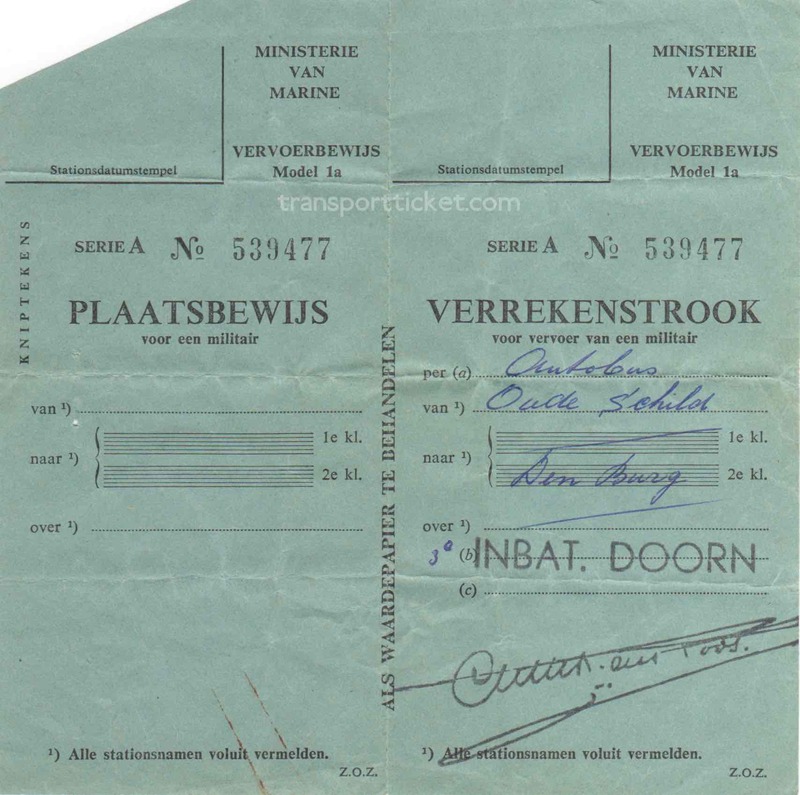 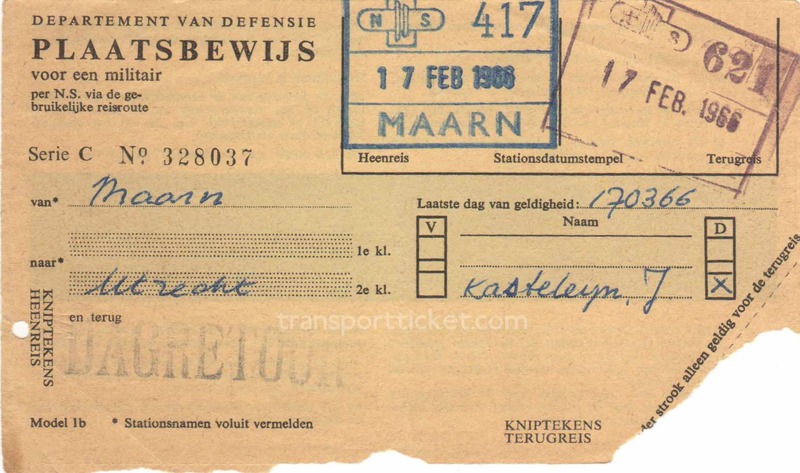 Most of these tickets were issued by the Dutch Ministries (or Departements) of War, Navy and Defense and were meant for military personnel on active duty. 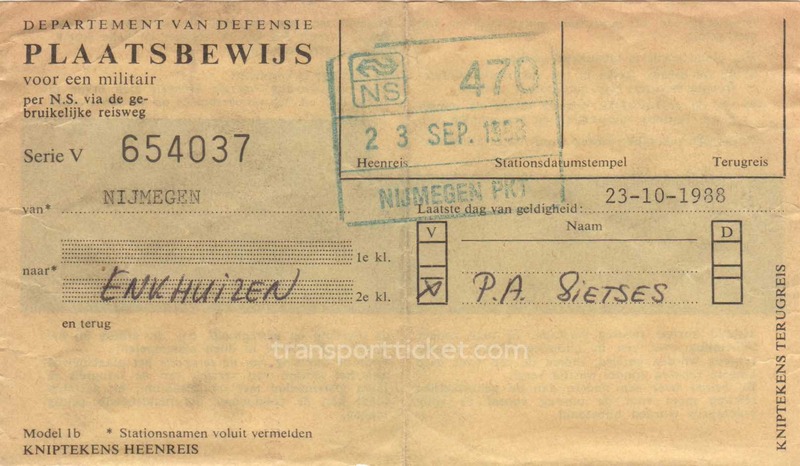 Departure point, destination, date and sometimes name and rank of the passenger and a signature of the commanding officer were written or stamped on the ticket. 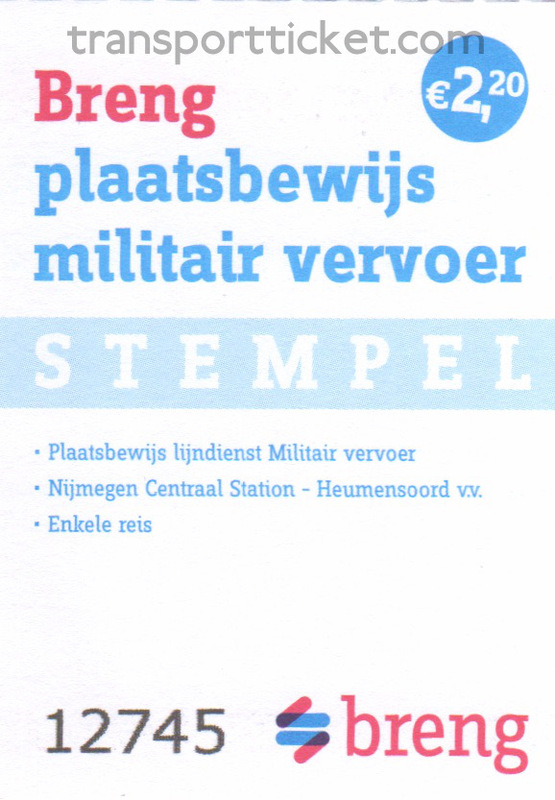 Issued by Dutch Railways (Nederlandse Spoorwegen, NS) are day passes for veterans. 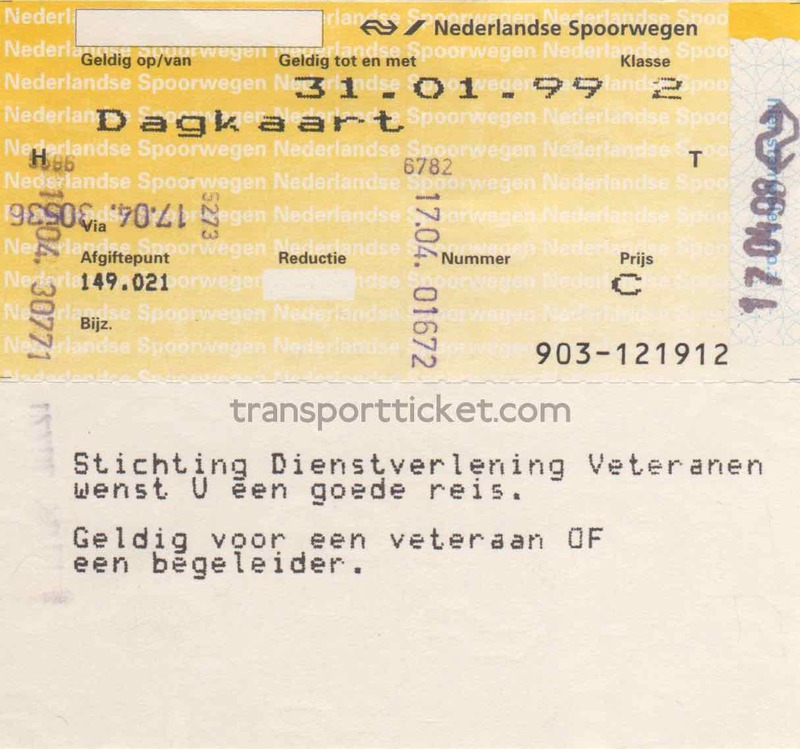 Even today, veterans who are no longer on active duty receive two railway day passes annually to visit veteren events. 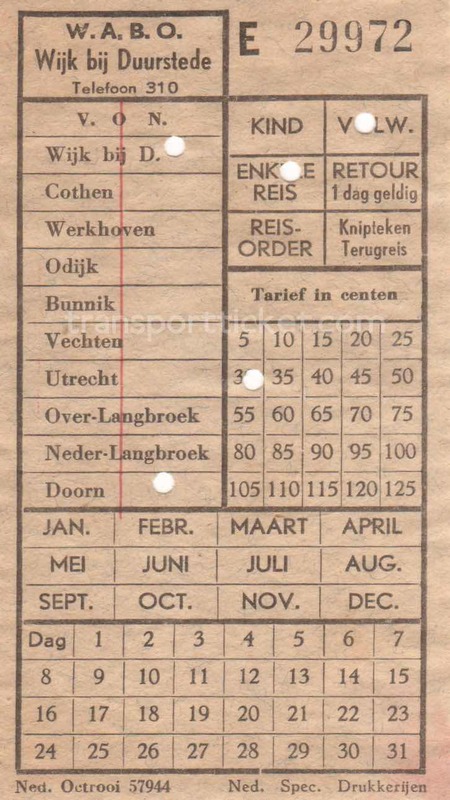 The Vierdaagse is an annual walking achievement event for four consecutive days in and around the town of Nijmegen, The Netherlands. 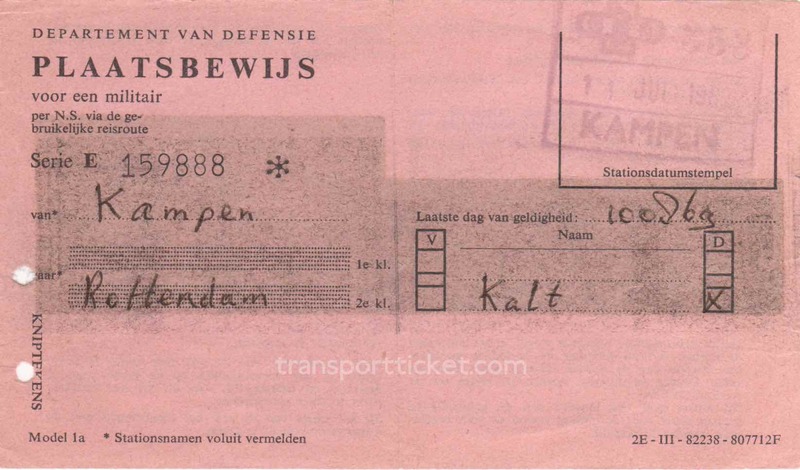 Since 1962 Kamp Heumensoord is used to house around 6,000 participants from the military. 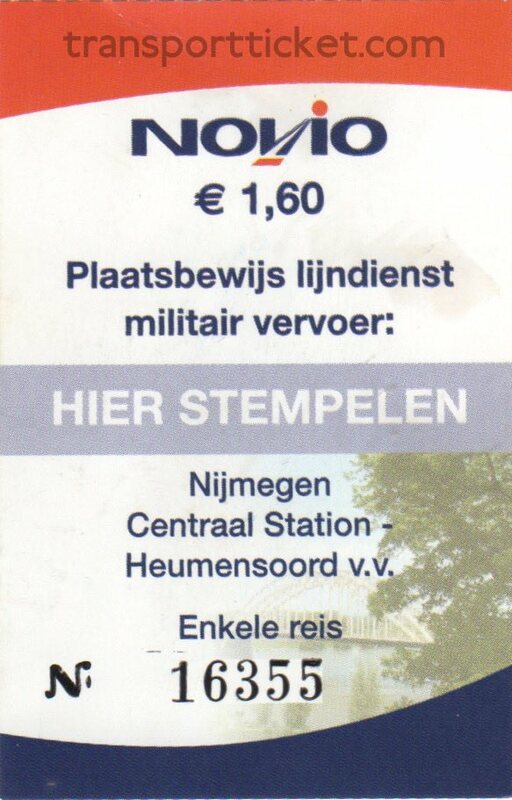 During the event shuttle buses run between the main railway station in Nijmegen and Kamp Heumensoord. 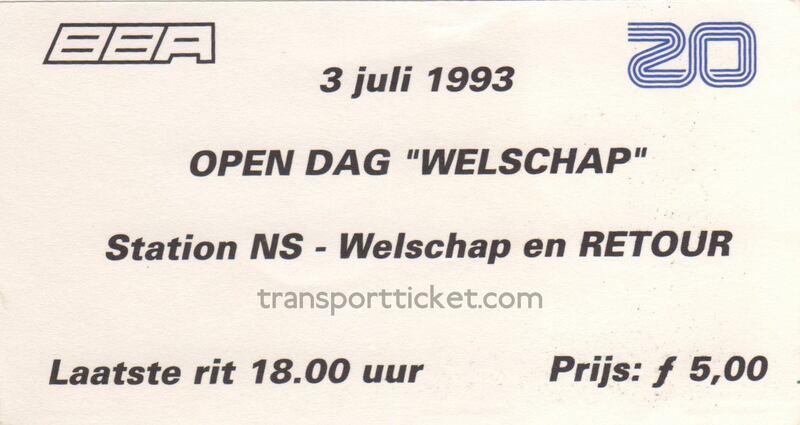 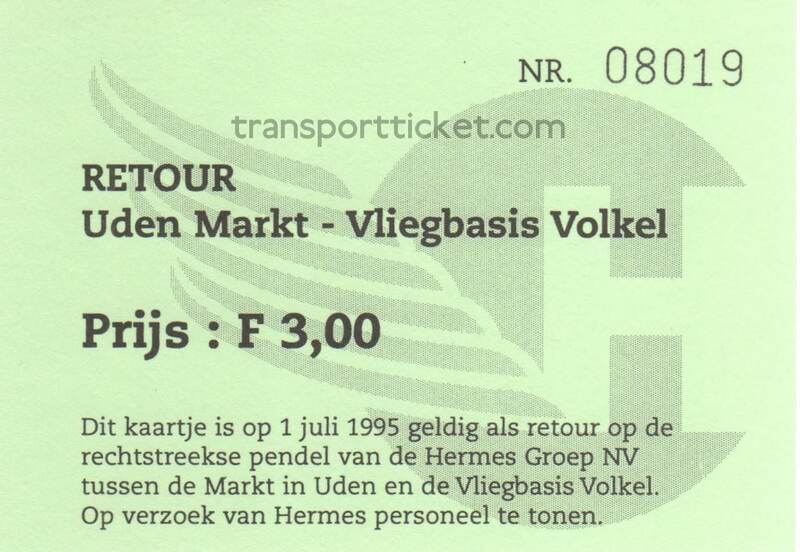 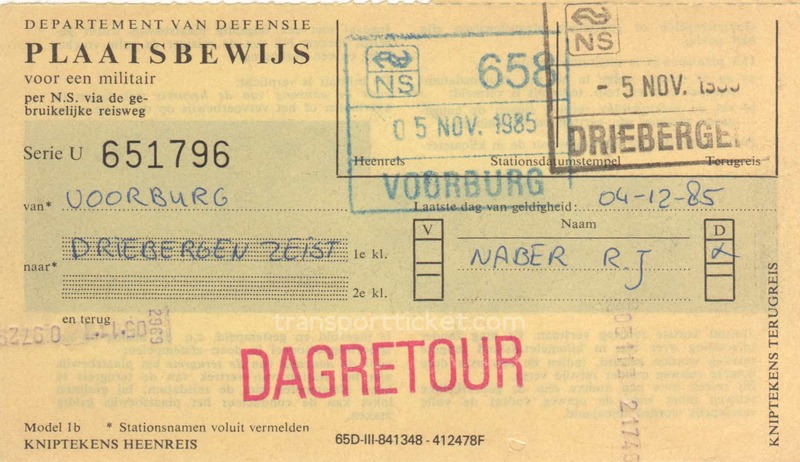 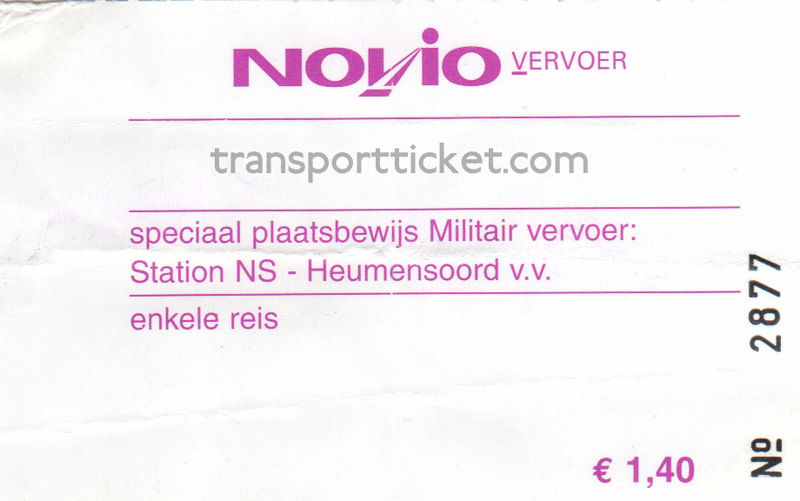 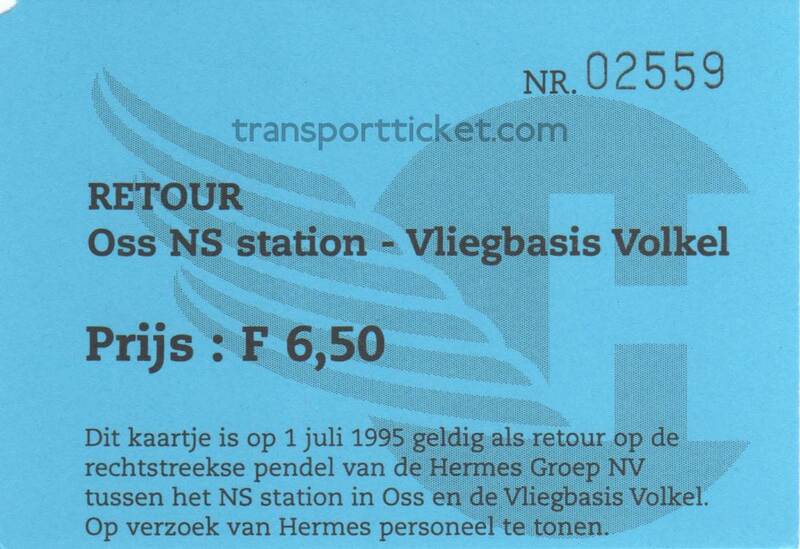 The tickets are issued by the local transport companies CVD (1956-1996), Novio (1997-2012) and Breng (2013-now). 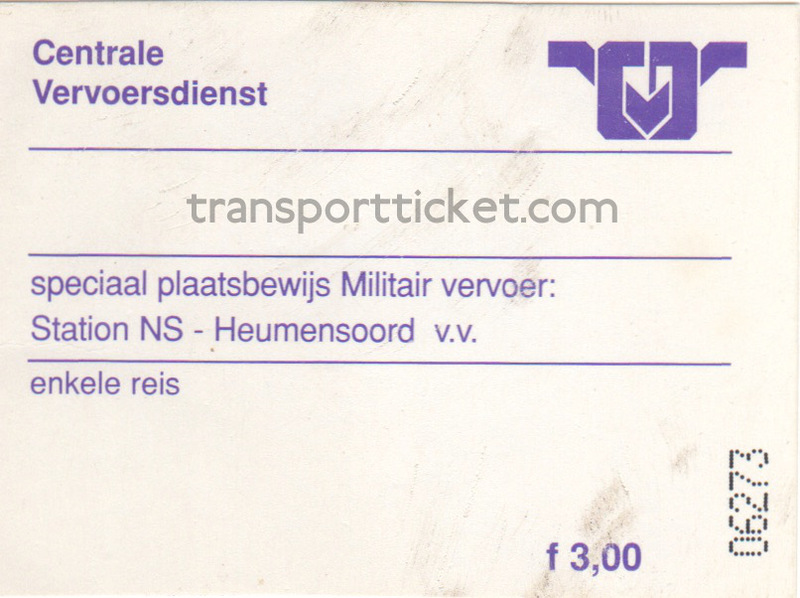 These tickets were not meant for military personnel, but for civilians. 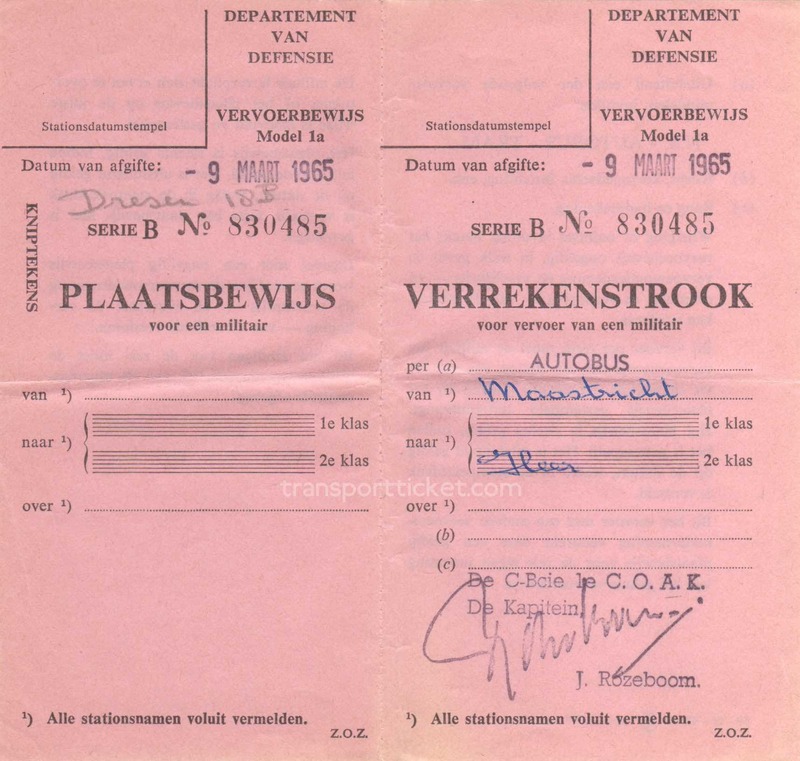 They were used for shuttle buses to military bases during open days. 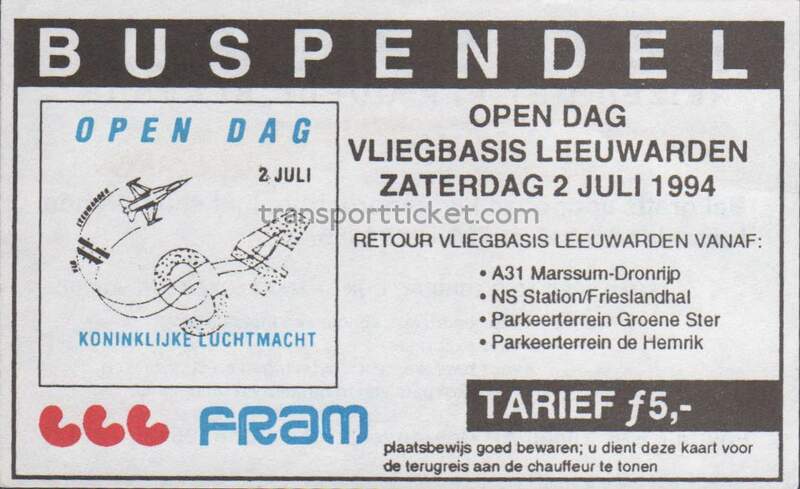 In these cases: open days on the airforce bases in Eindhoven (Welschap), Volkel and Leeuwarden. 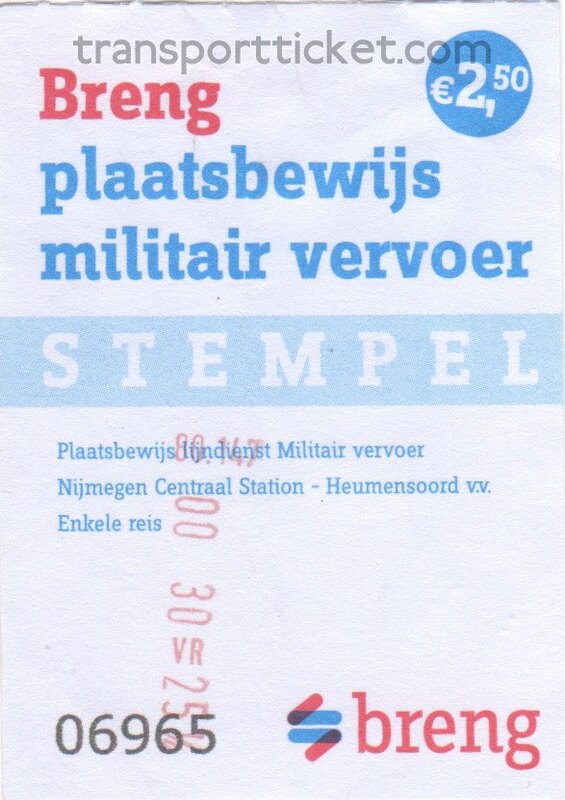 The last set of Dutch tickets are tickets that could be used by military personnel. 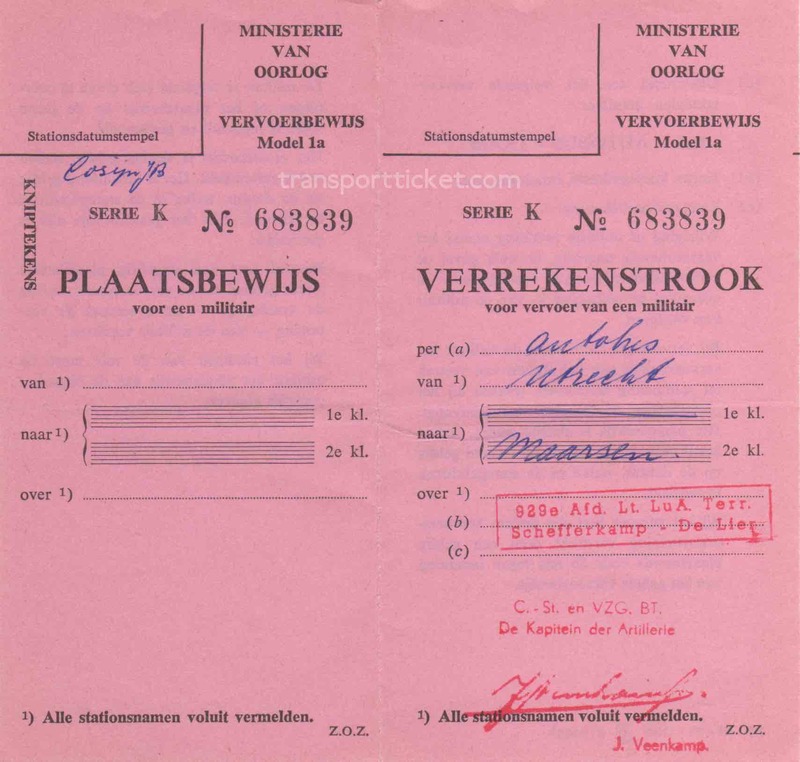 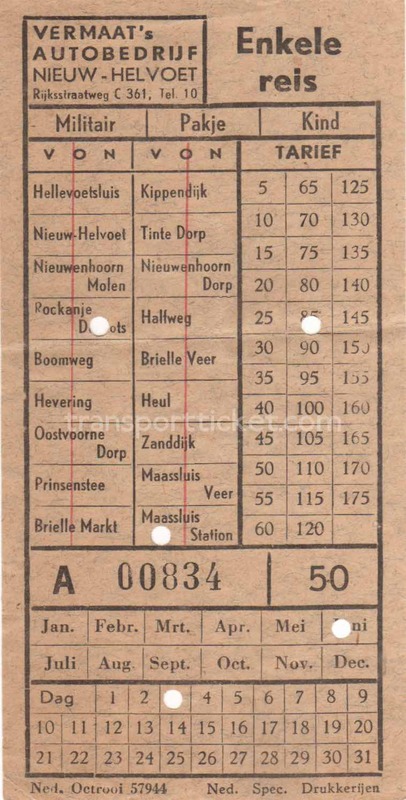 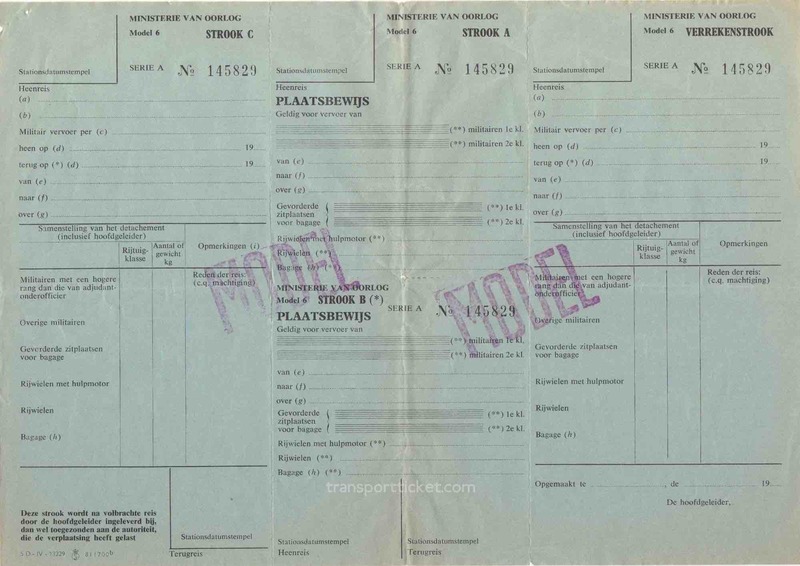 These tickets could however also be used for other groups like a bicycle (rijwiel), a child (kind), a dog (hond), luggage (bagage) or even a "standard" adult. 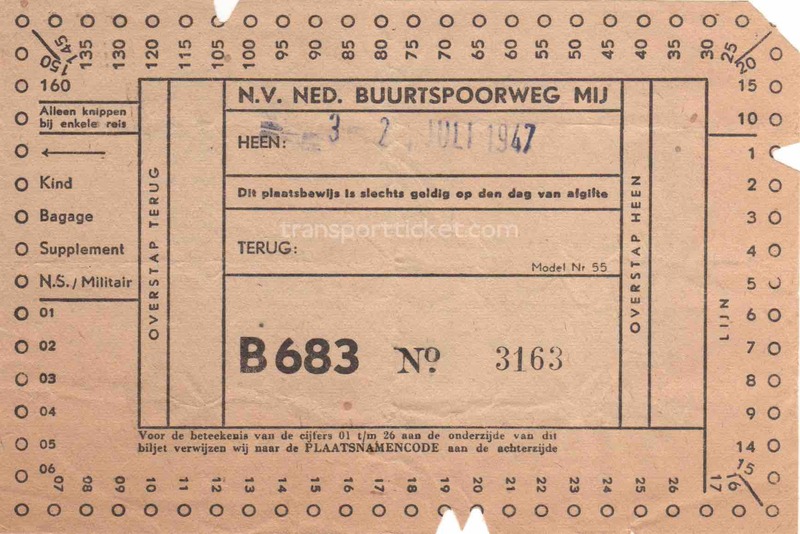 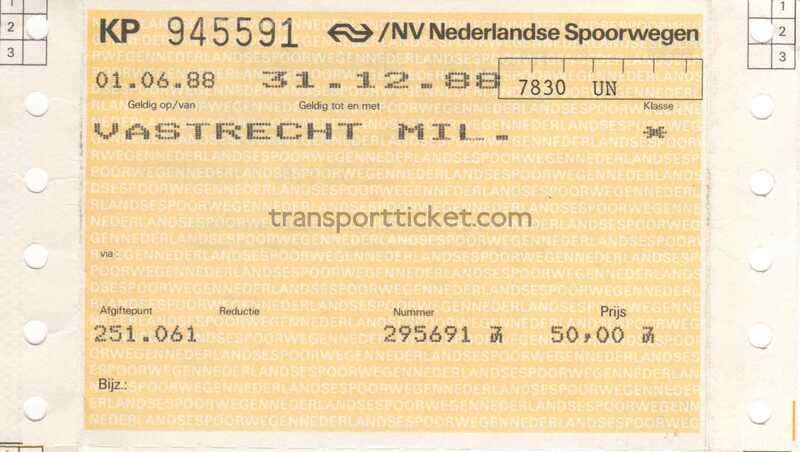 A marking on the ticket indicated to what type of passenger the ticket was sold.